A prime method for making contact with others was through one of a few small press media outlets that significantly helped build networks, spread word about words, and extend the reaches of “underground” voices and sounds. Our cornerstone in the 1980s and early 90s, Factsheet 5 (a “zine of crosscurrents and cross-pollination”) —published by Mike Gunderloy, Cari Goldberg and a legion of assistants out of Rensselaer, NY—was an ambitious and always dense review zine. At its peak it came out 6 times per year, 140 pages of roughly 8 point typeface. Through Factsheet 5 anyone could begin to connect on a larger scale with others publishing and working with audio—or any number of other forms (e.g., in Issue #37, 1990, Games, Artifacts, Microfiche, Software, Zines, Music Zine, Comics, Poetry, Video, Audio, and Books each had a section). The publication was challenging to absorb fully due to its dense codex form, and it really took effort to read. Since there was no word search if you wanted to learn about something particular it was time consuming! Other zines and magazines (e.g., Option, gajoob, OP, Your Flesh, Sound Choice, Forced Exposure, &c.) occasionally reviewed “spoken word” and sound poetry titles, though mainly focused on music. Michael Azerrad’s interesting book Our Band Could Be Your Life: Scenes from the American Indie Underground, 1981-1991 in part explores and divulges the type of networks underground/alternative music employed in the 1980s and early 90s. It is fair to say similar communities also existed in the poetry “world” (since at least the “mimeo revolution” of the 1960s), though outside the academy, writers who sought an audience had to cultivate their own networks, sometimes by starting magazines and publishing, hosting readings for those passing through and putting them up for a night. We Press began to discover, absorb, and make use of a seemingly detached, very subterranean, audio-based literary arts network as soon as our first audio issue was happening (as did our band, thelemonade). We began receiving tapes as soon as we solicited work, including some by Richard Kostelanetz—a pioneer in audio poetics whose experiments date back to the 1970s—which are presented on the We Magazine 11 cassette. Receiving the recordings, getting a sense of what was out there, was a tremendous learning and ear-opening experience. As an undergraduate I heard largely conventional poetry albums produced by Caedmon and Folkways, and later at Naropa I heard my first Giorno Poetry Systems LPs (Sugar, Alcohol, & Meat, You're a Hook), impressively populated by the school’s faculty. Then, as a doctoral student and radio programmer at WRPI, I learned about historic literary-audio releases such as the East Village Other: Electric Newspaper and the New Wilderness series of releases in the 70s and 80s. Ken Sherwood, in Charles Bernstein’s Close Listening (1998), chronicles some of the historic and contemporary audio resources available pre-WWW, though it favors institutional examples without indicating the vast backland of poetry cassette culture. Needless to say, a lot happened. Late 80s-early 90s Factsheet 5 discoveries—such as cassettes issued by John M. Bennett (Luna Bisonte Productions, OH), Jake Berry (AL), Blue Cube Music (IN), mIEKAL aND and Liz Was’ Xexoxial Endarchy (WI), RRRadio (Lowell, MA) and others is unquestionably where I began to encountering seriously alternative aesthetic approaches. 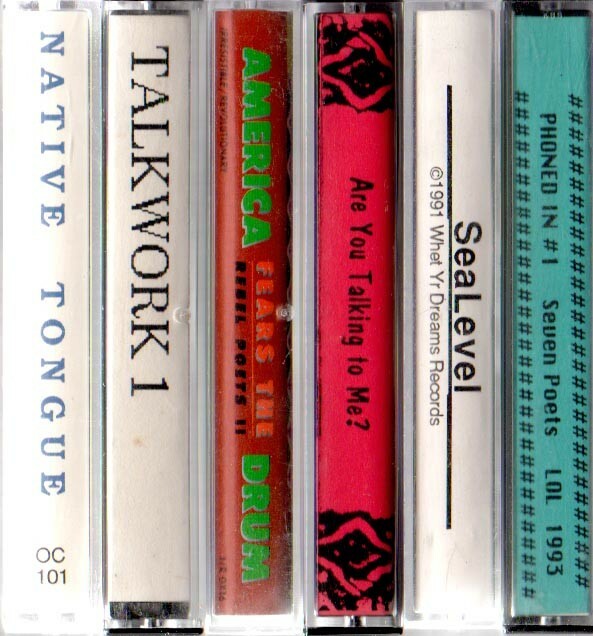 Other cassettes (anthologies or audiozines) from the period I’ve recently come across include, Hollyword (Rhino, 1990), Lost and Found Times (various), Talkwork (1990), Phoned In (1993), America Fears the Drum: Rebel Poets II (1992), Native Tongue (1990), Are You Talking to Me? (1993), and SeaLevel (1991); poets such as Pamela Z, David Jewell, Frank Messina, Henri Chopin, Bruce Andrews, Bob Cobbing, Teresa Clark/Carletta Wilson, Bob Holman, Bernstein, and many others in this not-completely-or-always-connected network of artists and technicians looked to build sonic and/or vocal bridges (with or without music) apart from the mainstream. Groups and individuals built structures outside of the corporate, governmental sphere—independent and decentralized—connected at first through the copy machine, and then cassette decks. The ability to experience this type of inter-community exchange, which required initiative from all parts, broadened my understanding of what was out there and possible as a performer and publisher. The Internet changes practically everything, and largely for the better with the availability of tremendous free audio archives such as Internet Archive, SoundCloud, ubuweb, PennSound, and scores of other outposts (including mass culture repositories such as Spotify). What’s missing is someone (or ones) on the Web really working together to tie such a wide spectrum of contemporary commercial, non-commercial, and anti-commercial contemporary art(s) together the way that Gunderloy and Goldberg did. Here I capture only sliver of what actually happened—taking examples from a single collection (of a practitioner, not a researcher, no less). I am certain that an enormous amount of glorious material is yet-to-be-accounted-for online. One can hope an ambitious scholar, who makes the rounds to various archives housed at Buffalo, Madison, Columbus, San Diego, New Haven, and points elsewhere, poring over copies of Factsheet 5 and Noospapers, could piece together a mighty compelling alternative narrative to North American expressive verse’s history, as well as a cultural history of the 1980s and the imaginative spirit of the time.